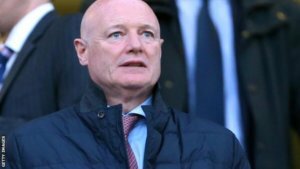 Peter Kenyon knows Mike Ashley well, and there’s a report in the Mail today that sources close to Ashley wonder if Peter Kenyon has acquired the funds to buy Newcastle United. For the last few months, Kenyon has been trying to get the funds to do the deal from here in the US with investment company Rockefeller Capital Management, and he seems to have secured the money to bid for the club. According to many reports this week four different bidders say they can pay £300M for the club and according to the Northern Echo two have signed non-disclosure agreements to study the financial records of the club. However, the Mail says that sources close to the Newcastle owner say they wonder if Kenyon has the funds to buy the club. We shall see, but there was news at the beginning of the year that Ashley would demand to know how any group trying to buy Newcastle will get the funds, and that would an initial step. Ashley says he wasted too much time on a possible acquisition with Amanda Staveley, which came to nothing. According to Ashley, Staveley never had sufficient funds to buy the club. The Mail report today is that Ashley has not yet seen evidence that Kenyon has the funds to buy the club. Kenyon’s backers need to understand the financial position Newcastle are in before they release funds to buy the club. But Ashley could demand that Kenyon reveal where the funds are potentially coming from before he goes any further – but he has not done that maybe because he has a good relationship with Kenyon. The other three bidders remain unknown but don’t be surprised if one of those announces a deal, and they buy Newcastle rather than the group led by Peter Kenyon, who is well respected in the football world and has lots of contacts. One of the four is said to be a single person who is trying to buy the club – presumably a Billionaire. Unfortunately, there are likely to be several reports coming out – true or false – which is why the quicker the deal is done, the better it is for everybody associated with Newcastle. If there are indeed four groups willing to pay Ashley’s price for Newcastle of around 300M (and he doesn’t put the price up) they should all be moving quickly to formally bid for the club. Newcastle winning games will help with that. With Kenyon’s excellent standing in the game and his professionalism, we would take with a pinch of salt that he doesn’t have the funding to buy Newcastle. Rockefeller Capital Management are interested in what Newcastle’s financial position is before releasing funds to Kenyon. One thing the deep dive will tell them is how much of their own money do they have to invest, once the club is acquired. Peter Kenyon is the lead man negotiating the deal – much like Amanda Staveley led the effort last year. We have no idea who the other three groups are, but they are said to be from the US and the Far East. Yeah I get how something like that would work but then it comes down to that only being given the go ahead if a take over occurs. If no takeover, you can say goodbye to that much being laid out for one player. Extended highlights of game yesterday on nufc site. Apparently deal is long way off. Kenyon does not have the funds. Smoke and lies by Ashley. We are not getting rid of Ashley and he’s here to stay. Representatives of Kenyon’s consortium are understood to have been in contact with various people they feel are influential in the fanbase. to stress that his interest genuine, and anything that threatens #NUFC’s form would negative for negotiations. Ok jib, admit it. What has he said to you? What’s happened to the writing on here? To be honest after the way a majority of fans treat the eleventh minute job, I doubt he is worried about a boycott anymore, however the continued bad publicity is surely having an effect and can’t tie in with his saviour of the high street persona. I like Branston beans, some like Heinz! Are we one of the four bidders to take over the club? ronaldo, I dunno – even assuming Ashley doesn’t sell, he will eventually have to have to break our transfer record. If he’s after a grand gesture to keep hold of Rafa, this window would seem like a good time to do it. Also, there is a certain £20M transfer fee surplus from the Summer to spend on the right players. Omg, the conspiracy theories on here are just plan getting old. He said, they said , my mate said. Let’s be clear here about possible buyers of the club, they sign an agreement not to talk about it. Let’s make that clear, they sign an agreement MA does not, he can talk about it as much as he wants. So we haven’t heard anything from any potential buyers like Kenyon, well he cannot talk about it and if he does he ends up losing his place at the table. I don’t for once think we have four possible buyers, what will we have next week five or six. Yes I get it, MA in the past has been full of shite, but I can only hope this one time it’s true and we will be saying goodbye to MA once and for all. The problem is the reporters don’t know what process Ashley’s legal people have put in place for the sale of the club and at what stage prospective buyers need to provide proof of funds in order to continue, so it’s all speculation. When buying a house you have to provide proof of funds to cover the deposit straight away and get a mortgage agreement in place to cover the rest before the purchase process can continue. When buying a club there will be a basic agreement for the purchase of the club. This will be non-binding and subject to the completion of satisfactory due diligence by the buyer, presumably after signing a non-disclosure agreement. Then agreement would be reached and a bid would follow. The question is, at what part of that process does the buyer need to provide proof of funds? Ashley has said in the past that any buyer needs to prove they have the funds up front so if this is true, it is before due diligence has been carried out but reports now coming out that Kenyon is being given access to the accounts so he can report back to his consortium and hopefully persuade them to firm up their interest. If this is true, it would seem they don’t have to provide proof of funds up front to gain access to the accounts. Again I say, no reporter knows the process put in place so it’s all based on speculation.